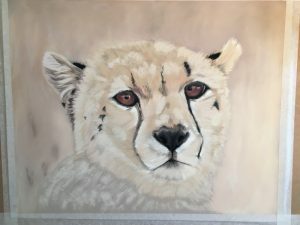 As you will see I have made quite a bit of progress on the Cheetah Cub, but I have once again put him aside whilst I decide on how to take him forward. 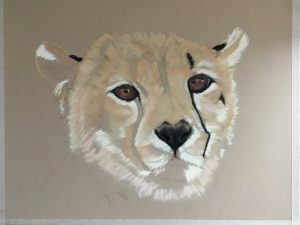 I also want to think more about how I am going to depict the background as he is sitting in amongst coppery coloured grasses on the Serengeti. This is amazing. What materials are you using? Which charcoal pencils do you recommend? It is very uplifting to see the work artists like you are doing to promote conservation and awareness. Thank you Barbara for your lovely comments. I am a keen conservationist and support a number of charities for African Wildlife. 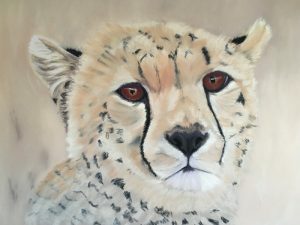 Do you paint and if so do you paint wildlife. I mostly use Unison soft pastels and and a mix of Bruynzeel Sakura, Faber Castel, Caran D’Ache, and Creatacolour pastel pencils, but with my pen and tinted charcoal sketches and drawings I use Derwent Tinted Charcoal pencils and Staedtler pigment liners. Many thanks for your really helpful reply. Some artists are not always keen to share their secrets, so I am grateful indeed! I am a late ‘arrival’ at painting and drawing, having had a lot of other commitments to juggle, and I do enjoy water colour now, (but not too many trees, please!). Animals have always been central to my life, and I have been able to travel quite a lot to see them in the wild. I am also a very keen conservationist. Pencil drawing is an exciting area at the moment, with the opportunity to use pastels and pastel pencils being an intriguing option, so I am going to see where it all goes. I shall look at your website frequently! With kind regards and many thanks for the pleasure you give with your work.